Many emotions are entwined in the theater piece Brodsky/Baryshnikov, which had its premiere at the New Riga Theater in October and will open at the Baryshnikov Arts Center in New York in March. Its subject is Joseph Brodsky, who was born in Leningrad in 1940 and died in Brooklyn in 1996. Other Russians of Brodsky’s time—notably his great elders Anna Akhmatova, Osip Mandelstam, Marina Tsvetaeva, and Boris Pasternak—were made to feel more keenly than he their government’s scorn for artists, but his case too is notorious. Soon after he began circulating verse in samizdat in his late teens, he came under the eye of the authorities. He was denounced in a Leningrad newspaper in 1963 as “pornographic and anti-Soviet.” In 1964, he was tried for “social parasitism” and sentenced to five years’ hard labor. He landed in the small village of Norenskaya, in the Arkhangelsk region of the Arctic. By day he chopped wood and hauled manure. By night he taught himself English, and read English and American poetry—above all, John Donne, Robert Frost, and his idol, W.H. Auden—in his hut. He later said that this was one of the happiest times of his life. Meanwhile, the transcript of his trial had been smuggled to the West, and his case became an international scandal. Embarrassed, the Brezhnev government released him after only a year and a half. This did not mean that he was free, however. By then, because of the trial and because of poems of his that were being published in the West, he was a famous man. When literary dignitaries came to Russia, he was often the person they wanted to meet. But he could not get a poem published in the Soviet Union, not to speak of obtaining permission to attend literary conferences outside the Soviet Union. This is the sort of tragicomedy in which the USSR specialized. The authorities eventually tired of it, though, and one day, in June 1972, he was simply taken to the airport and put on a plane. He did not know whether the plane was going east or west. It went west, to Vienna, and at the airport he was met by the American Slavist Carl Proffer, whom he knew, and whose small press, Ardis, in Ann Arbor, Michigan, would publish a number of his writings in Russian. Auden had a second home outside Vienna, and the day after Brodsky’s arrival Proffer rented a car and deposited Brodsky there, to what was apparently Auden’s surprise. Brodsky stayed for four weeks. Auden got him some money and called various people to say that he was coming. Proffer arranged for him to be given a job as poet in residence at the University of Michigan, where he himself taught. In July 1972 Brodsky flew to the United States, where he would live until his death twenty-three years later. Almost always, he taught—after Michigan at other schools, above all, Mt. Holyoke, where he became a chaired professor. Over the years he received just about every important award a poet could want, culminating in the Nobel Prize in 1987.
a traditionalist in the sense that he is interested in what most lyric poets in all ages have been interested in, that is, in personal encounters with nature, human artifacts, persons loved or revered, and in reflections upon the human condition, death, and the meaning of existence. This seems rather soft-spoken, but it is accurate. Brodsky was not a modernist in the sense of embracing the absurd or expressing weariness. Quite the contrary. He pursued the “great themes,” energetically. if you really want your poem to work, the usage of adjectives should be minimal; but you should stuff it as much as you can with nouns—even the verbs should suffer. If you cast over a poem a certain magic veil that removes adjectives and verbs, when you remove the veil the paper still should be dark with nouns. He too showed a hidden terror, and long before his trial the Soviet Union had given him cause. As a small child he nearly died of starvation during the siege of Leningrad. Because the family was Jewish, his father, a photographer, lost his job during Stalin’s onslaught against the Jews in the early 1950s; the family was supported, barely, by his mother’s clerical work. Partly to help out, Brodsky quit school at fifteen and took various low-level jobs, including, at one point, cutting and sewing bodies in a prison morgue. He fell in love with a painter, Marina Basmanova, but soon his friend and fellow poet Dmitri Bobyshev was also in love with Basmanova. That was when the denunciations began—a fact from which people have drawn conclusions about Bobyshev’s responsibility. Brodsky was twice detained in psychiatric hospitals. Then came the trial, the “internal exile” in Norenskaya, and, ultimately, the expulsion. Another writer might well have expatiated on the pain of witnessing such a scene. Brodsky does not. For that modesty as well as his tremendous poetic powers he was cherished not just as an artist. He was a moral hero, to many people. One was Alvis Hermanis (born in 1965), who is an important man in European theater. Hermanis started as a movie actor in his native Latvia. Now he is a director and works very widely across Europe, especially in German-speaking theater and in opera. (He just directed a Damnation de Faust at the Paris Opera. In 2018 he will stage Lohengrin at Bayreuth.) Since 1997 he has also been the head of the New Riga Theatre, a playhouse that opened, under that name, in 1902. In later years it was put to various uses by Nazis and Communists, but in 1992 it reopened as a repertory theater. He is like a surgeon who is cutting with a knife your belly and looking straight in your eyes. He is killing you, and he is telling you. I had never before read a writer who has so no hope, who gives not the slightest chance. Whatever illusions you had, Brodsky makes you say goodbye to them. And so you achieve a sort of Buddhistic calm. Hermanis conceived Brodsky/Baryshnikov as a tribute to Brodsky, but as the title indicates, he wrote it to be performed by only one man. Mikhail Baryshnikov is a favorite son of Riga. Both his parents were Russian, but after the war the Soviet Union was faced with a drastic housing shortage, and the outlying territories were forced to take in many Russians, including Lieutenant Colonel Nikolay Petrovich Baryshnikov, who taught military topography, and his wife, Aleksandra Vasilievna. Mikhail Nikolayevich was born soon afterward, in 1948, and lived in Riga until, when he was in his early teens, his mother died (by suicide), his father remarried, and his ballet teacher—he had started lessons at age nine, at his mother’s behest—decided that he had progressed beyond the training that Latvia could give him. He needed to go to Leningrad, to the Kirov Ballet’s Vaganova Institute. By the time Baryshnikov graduated from the Vaganova Institute and joined the Kirov in 1967, Brodsky had already returned from Norenskaya, and for the next seven years the two men lived in the same city. Baryshnikov knew Brodsky’s poetry, but the two men did not meet, and if they had, it wouldn’t have been good for Baryshnikov. Brodsky was a dangerous person to be seen with. By this time, furthermore, Baryshnikov too was under suspicion, as a defection risk. 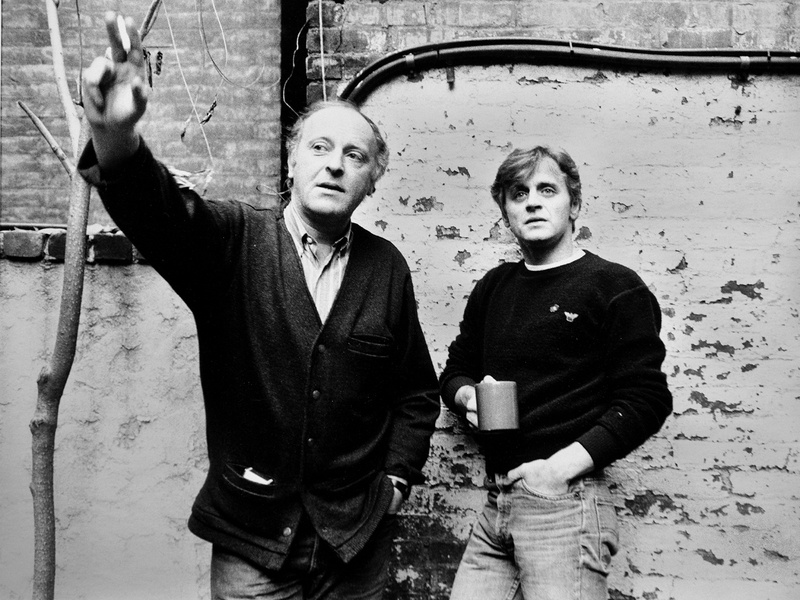 In 1972, Brodsky was thrown out of Russia, and two years later Baryshnikov threw himself out. On tour in Toronto, he walked out of the stage door after a performance, signed some autographs, and then, instead of getting into the company bus, he turned and ran. A getaway car, arranged by friends, was waiting a few blocks away. He was now a Western artist. In a long interview that he recently gave to the Latvian magazine Laiks, Baryshnikov recalled that he met Brodsky soon afterward, at a party at Mstislav Rostropovich’s house. “Joseph was sitting on a couch. He looked at me and said, ‘Mikhail, come sit down. There are things to talk about.’” Baryshnikov, though a celebrity, considered Brodsky a far greater celebrity. “My hands were shaking. The cigarette was going back and forth, like this,” he says, waving his hand like a windshield wiper. He sat down, and they talked for a long time. Thereafter they were friends for over twenty years, until Brodsky’s death. They spoke to each other every day. In Brodsky, born eight years before him, Baryshnikov acquired a kind of older brother, and he needed one. Though a number of people were very kind to him, he did not, at this early point, have close friends in the United States, and he was slow in making them, because he had no time to study English. With Brodsky he could speak in Russian, and they had a city, a government—in some measure, a history—in common. “Over the years that we spent together, he really set me on my feet. I acquired a kind of certainty.” In addition to his lodgings in Ann Arbor, Brodsky eventually found an apartment in New York, on Morton Street in Greenwich Village. When he was in town, he and Baryshnikov would take walks along the nearby Hudson River. Or we’d drink whiskey or we’d talk about girls or whatever—anything—and it was a real release for me. His house was so cozy. And there were always interesting people: Czesław Miłosz, Derek Walcott, Stephen Spender, Susan Sontag. He got me to read Russian classical literature that I hadn’t had time for when I was in Russia. 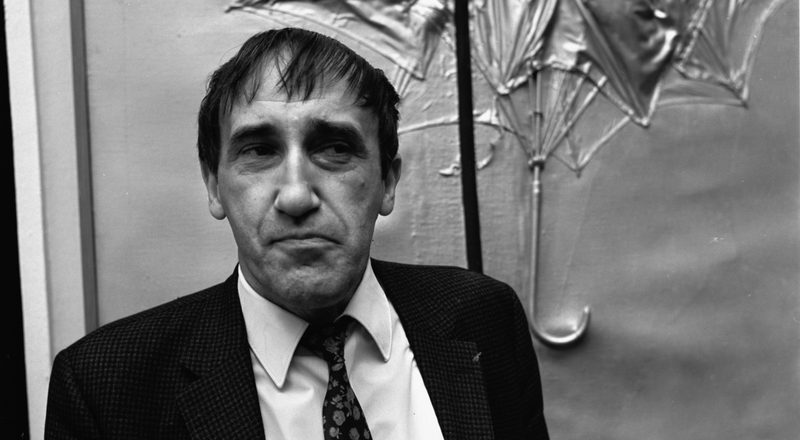 I couldn’t yet talk to him very seriously about poetry, but I knew some poems by heart—Baratashvili, Mandelstam—and he would get me to recite them. He has dumplings inside him. There’s smoke coming from the hearth. And we’re siting here drunk. As the lights go up on Brodsky/Baryshnikov we see a small glass house, nine feet by eighteen, with a front door and a back door, sitting in the middle of an otherwise empty stage. The house is in Art Nouveau style—it looks as if it had been made by the French Art Nouveau architect Hector Guimard—but with certain odd features. Next to its front door, for example, is a dirty old fuse box that periodically spits out frightening sparks. Also, there is some sort of blackish moss creeping down the wooden strips that join the glass panels. The music adds to the strangeness. There seems to be a sort of distant chorus, but sounding an unvarying note, plus, in the foreground, a noise of crickets. (This becomes more strange when you find out later that the distant chorus is also a recording of crickets, but very, very speeded up.) Both elements—the set design, by Kristīne Jurjāne, and the score, by Oļegs Novikovs and Gatis Builis—are elegant and sinister at the same time. I asked Hermanis whether he hadn’t worried that his show would turn out to be static—a poetry reading. He said no. I had a story in my mind, that the play would be about a meeting between two people who had been closest friends for twenty years, and then one died. The performance would be like a spiritist séance. Direct communication with the audience is not our goal. Audience is not necessary. Audience is able just to witness. Baryshnikov designed all the more elaborate movements, and he gives us a lot to look at. He spins, he stands on the chair, he strikes classical poses, he checks his teeth, he drinks the Jameson, he takes his clothes off and puts them on. He is constantly moving in and out of the house and thus from a state of firm reality to a sort of watery, dreamlike image as we watch him through the glass. During the recitation of “The Butterfly,” he chases an invisible butterfly and then, wittily, turns into one. During a beautiful poem about a horse, he does a brief flamenco dance, his chest as high and proud as a horse’s. There is a crisis. In the course of the poem “Portrait of Tragedy” he undergoes a grotesque series of convulsions. He stabs his navel so hard—he is shirtless here—that you think he is really going to harm himself. But the main drama is in the use of the language. Sometimes Baryshnikov reads the poems from one of the books; sometimes he whispers the words, sometimes he yells them, sometimes he just opens his mouth and lets them fall out. Usually he speaks them from memory. Unnervingly, sometimes Brodsky reads the poems, over the sound system. (At those times, an old reel-to-reel tape recorder turns on one of the benches.) But then sometimes Baryshnikov too reads the poems on tape, and you’re not always sure which of them is speaking. Brodsky chants his poems, as some poets do, and Baryshnikov too chants, and davens, as if reciting a Jewish liturgy. Hermanis told me that Baryshnikov did this without being directed to, and that it is natural to people reciting poetry. It is part of poetry’s shamanism, he says. Great dancer that Baryshnikov is, he has always been a considerable actor as well, and the treatment of the language is the most impressive thing in the show even, probably, to those who are getting it from the supertitles. Many knowledgeable people say that Brodsky’s poetry loses a huge portion of its power when it is not in Russian. “How could anyone who had not read him in Russian understand him by his English poems?” asked Isaiah Berlin, speaking, I believe, both of the poems that Brodsky wrote in English (he tried) and of English translations from Russian, both by him and by expert translators, often working with his help. “It’s utterly incomprehensible. Because there is no sense that they were written by a great poet. But in Russian,…from the very beginning, as soon as it starts, you are in the presence of genius.” Brodsky himself seemed to admit the problem. He called himself “a Russian poet and an American citizen.” His friend Lev Loseff, who taught in the Russian department at Dartmouth for thirty years, said in his masterful book on the poet that Brodsky won the Nobel Prize not for his poems, but for his essays, most of which he wrote in English. Alvis Hermanis says that he knows Brodsky’s work in translation and that “there is no way to compare it to what he did in the Russian language.” But this does not discourage Hermanis. Remember his statement that reading Brodsky’s poetry is a physiological experience. 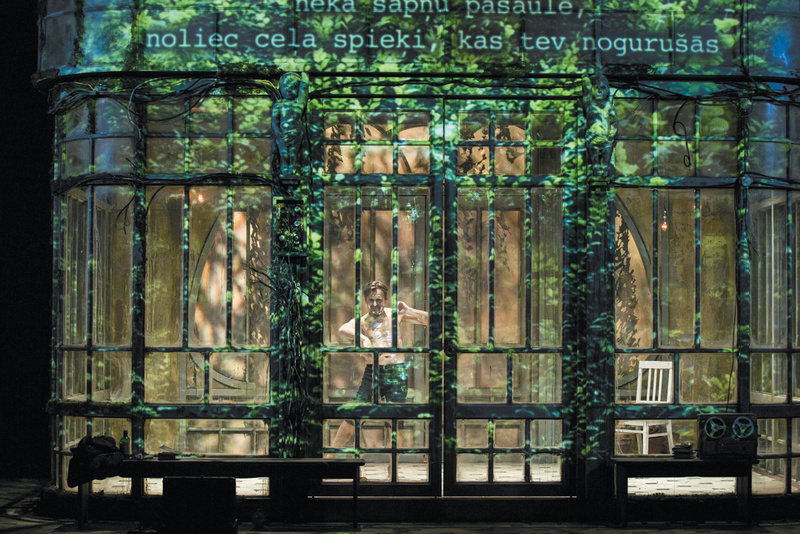 In Brodsky’s mind, he says, language “bubbles, it scratches, it never stops.” And the play aims to show that. As much as I am interested in the sense of the poetry, I am interested in the sound—how it goes through the body, sensual, erotical, or like an electrocution. Misha was interested in that, too, and willing to show it. The play is a real striptease. Misha is brave, he is crazy. For both men, this is no doubt related to what is said to have been Brodsky’s belief that poetry was not something contained in a language as much as it was, itself, a language, speaking truths found only there, and which you ignore at your peril. Indifference to poetry, he felt, underlay the Soviet Union’s political crimes. In the Paris Review interview, Brodsky told Birkerts that his main interest was “the nature of time…what time can do to a man.” By which he seems to have meant not just that time kills us; it may also efface any sign of our passing on this earth. Of the poems that Hermanis collected for his play, the most moving, I think, is “Letter to a Wall,” written by Brodsky when he was leaving his job at the prison morgue. “Keep my shadow,” he says to the wall. “Keep my shadow. I don’t know why./Preserve my shadow. I cannot explain. I’m sorry./It is important now. Preserve my shadow.” Of course, a shadow is a thing that may vanish instantly, and the people passing this particular wall—criminals, madmen—would have been most unlikely to be memorialized. That is why he chose the wall. He was twenty-four, and his trial was coming up in four months. He was afraid of being extinguished. In 1990, Brodsky got married, to Maria Sozzani, an Italian woman with some Russian ancestry as well. She was twenty-two years younger than he. They had a child, Anna, in 1993. But he was already in poor health. “It’s hard to walk the length of a building,” he wrote to a friend late in 1995. A month later, his wife went to his study in the morning and found him dead on the floor, of his fourth heart attack, at fifty-five. He was buried in Venice. At the end of Brodsky/Baryshnikov Baryshnikov packs his things back into the suitcase and heads out the back door of the little glass house. But something strange has appeared right beyond the threshold: a big, bushy green fern. It wasn’t there when he arrived, or it wasn’t lit so that we could see it. The play has been about a dead man, or a man visiting a dead man. He should not, at the end, be faced with this robust greeting from Mother Nature. Maybe Hermanis is saying that Brodsky was right: that there is some truth-beyond-truth that poetry, and nothing else, confers. Maybe if, in Hermanis’s words, you let yourself be electrocuted by Brodsky, you don’t die. You start to live. Tadeusz Kantor (1915–90) is best known as an outstanding and highly original figure of 20th century theatre, as well as the creator of his own theatre group and of productions imbued with poetry derived from his own complex Galician origin. He is also known for being one of the most important figures of the Krakow art scene and arguably the most prominent representative of the Art Informel movement in Poland. Kantor is also credited with inventing and naming the medium of emballage (from French “emballer,” meaning “to wrap”), a practice of wrapping up various objects, which defined his art works following the Informel period. Celebrating the centenary of Tadeusz Kantor’s birth, the exhibition Tadeusz Kantor: Inbetween Structures brings a new perspective to Kantor’s complex theatrical, cinematic and visual oeuvre. 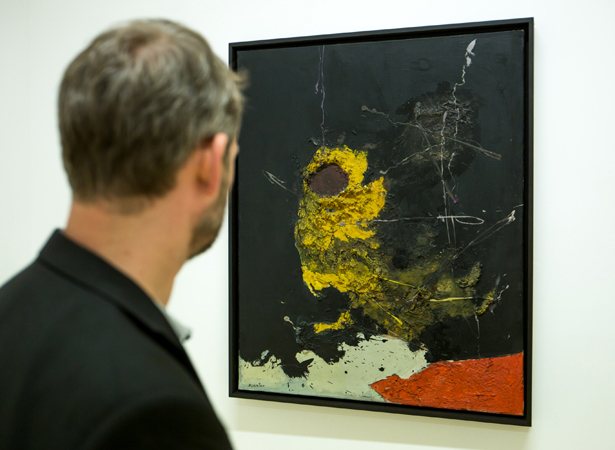 Focusing on the early phase of Kantor’s artistic career (1954–65), the exhibited works (which include the long lost film Attention!…, as well as numerous drawings, gouaches, paintings, collages, photographs and written manifestos) not only highlight the profundity of his early art, but also shed new light on the international perception of Kantor as a visual artist. It is crucial to understand that Kantor’s visual works were equally important to him as his theatrical productions. All of his works are explorations of intense artistic processes that were leading in different directions and structures. Choosing the actual form of a work was never random, but rather very carefully decided upon. This wide artistic oeuvre displayed as part of Tadeusz Kantor: Inbetween Structures reveals the complexity of Kantor’s ideas about art and forges a new perspective on his playful approach to bridging the gaps between art forms as well as working creatively in-between these fields and the structures of art. His capacity to move through existing categories and forms is quite unparalleled to other artistic practices of the time. The exhibition Tadeusz Kantor: Inbetween Structures will not only foster a fresh look at one of the masters of modern Polish art, but will also raise an understanding of the unmatched creative and open atmosphere that existed in Poland in the years 1955–59. This project was initiated by Polish Institute Berlin and is co-produced by the Polish Cultural Institute in London, the Polish Institute in Berlin and Summerhall in partnership with Cricoteka, National Museum in Krakow, Museum of Modern Art in Warsaw and Krakow Festival Office and supported by Culture.pl. Forty-seven architecture teams from Poland and abroad have been invited to take part in the competition for development of architectural – urban design concept for the new seat of „Cricoteka“ as well as the Museum of Tadeusz Kantor in NadwiĹlaĹska Street in Cracow. On July 19 the Centre for the Documentation of the Art of Tadeusz Kantor „Cricoteka“ finalized the procedures related to verification of the applications for the competition for the new seat, including the erection of the Museum of Tadeusz Kantor. Mr. Janusz SepioĹ was elected Chairman of the competition Jury. Then the competition Jury acquainted itself with the documentation submitted by forty-nine architecture teams. Following its first session, twenty-eight teams were invited to take part in the competition and the remaining twenty-one were summoned to provide the missing formal documents in their applications.Therefore the number of qualified teams ultimately amounted to forty-seven, including four foreign teams. The deadline for the architects to submit their complete competition submissions expired on September 15, the adjudication and verdict announcement took place on 26 September 2006. At present Cricoteka is located in several different branches: the Centre?s Office and The Krzysztofory Gallery are situated in SzczepaĹska Street, the Archives are in Kanonicza Street, the Gallery – Atelier of Tadeusz Kantor in Sienna Street and the collection storerooms are located in PrzemysĹowa Street. These scattered locations, limited space conditions and a small – only 300 m2 in total – exhibition area, which does not fulfil the basic requirements and standards for exhibitions, do not allow to meet the expectations of the vast number of people interested in the artist’s work. The envisaged new seat of the Centre (with its total area of 3000 m2) should fulfil a broad cultural function (place for artistic events, visual arts exhibitions, theatre performances, concerts and presentations as well as seminars and workshops) as well as allow for the exhibition of the artistic output of Tadeusz Kantor in all areas of his activity, which so far has been impossible due to the limited conditions of the Centre. The envisaged investment should constitute a creative adaptation of the historic complex of the former PodgĂłrze Power Station preserving the historic values of the buildings and its recognizable structure, which can reflect the acceptance and identification with its location. Owing to the significance of Tadeusz Kantor’s art for the world culture, the facility should constitute an expression of architectural homage paid to the artist, simultaneously enabling the presentation of his artistic output in a manner adequate to the importance of his work and creating the right conditions for the artists‘ comprehensive co-operation. The competition is announced in accordance with the resolution of the MaĹopolska Voivodeship Board. The investment plan has been entered into a Long-term Investment Programme of the MaĹopolska Voivodeship for the years 2006 – 2008.